If you don’t want to believe something is true, because that “something” conflicts with your deeply held personal beliefs, then of course you ignore that “something”. That’s why the Jesuits wanted to educate indigenous children in Catholicism while they were young, to tutor them in a manner that would defy later expositions of truth around them. The price of this included the children’s mother tongue and their cultural history. In much the same way a large majority in North America and Europe have been indoctrinated through television, movies, and the once-respected print media. I find myself often reflecting upon my own exposure and questioning the possible effects. I still vividly remember a news video from, I think, the 1980s in which a late middle-aged American was being asked to explain his outrage over a local demonstration that he was rallying against. The man was at a loss for words, and was visibly tremulous, with spittle showing at his lips: “They had a flag with that..that…Russian thing”. He was referring to the hammer and sickle icon of the USSR, but he didn’t have the vocabulary to draw upon, just the Cold-War-induced imagery from decades of propaganda. But thick as you are…pay attention! It seems that we are currently in WW3, but this war doesn’t necessarily have borders nor clearly defined physical lines. Concepts are the new “prize” among all the players. 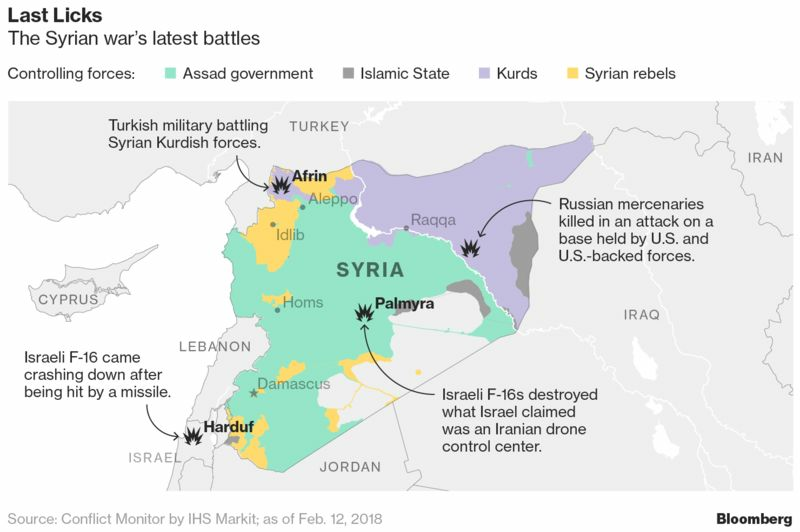 …Turkey is pursuing an offensive against Kurdish fighters in northwest Syria… …Syrian government-backed forces have agreed to help the Kurds fight Turkish troops and may enter the border town of Afrin within hours, according to the official SANA news agency…. Interesting OPINION piece by Leonid Bershidsky follows the article. QUOTE: I see a bigger threat than that: Limiting foreigners’ ability to troll U.S. politicians, or even the political process as a whole, could be the first step toward doing the same for Americans. Meddled in democracy? Allowing everyone to vote is a prescription for Socialism, or Social Democracy, if you prefer. Universal suffrage didn’t exist in the beginning of the USA, and that was one thing that has slowly weakened our liberty. Of course the Constitution itself was a mistake. ‘Democracy, the God That Failed’, by Hans Hermann Hoppe, is a book that more people need to read. Someone should ask him about the methods used in the meddling of Italian politics and suddenly the moving parts of both American and Italian deep states show themselves and the dirtiness of CIA becomes apparent. I’m sure you’re quite as outraged as many are at the brutal suppression of the Semitic Palestinian peoples, though. Anti-apartheid sentiment seems to be widely held around the world, but the Israeli government doesn’t seem to care, and it keeps degrading Palestinian families in the most inhuman way. For some reason I feel I should ask how Mr. Bond is doing? I hope you are neither an anti-Semite nor anti-Jewish, that you actually are sure of that yourself, and that you have enough of a healthy arrogance about your right to think freely that you feel offended that someone should accuse you of those types of stupid ideations. Zionism is a serious threat to world peace, and just like Nazism is based on a twisted and mendacious historical mythology, and is part of a disinformation and social engineering campaign that is a much bigger machine all together, so it’s especially unfortunate when those of us who refuse to go along with that agenda fail to do so with clarity and surety. I also hope you don’t mindlessly hate Germans as the “Hun” as all Americans were trained to do during WWI (in billiards that’s called “leaving the table”). It is true that German society after WWI was engineered to hate and scapegoat Jews for instance, and that the wave of complacent compliance with that malicious standard was very popularly adopted by the German public, but the point is, that is how people (any “people”) can be manipulated, and that’s why we all have an unending responsibility to monitor ourselves not to fall prey to such stupidity so as to feel compelled to do the dirty work of our nefarious, shadowed would-be (and in many way de facto) rulers. European Jews are not Semites. Referring to European Jews as Semites is a way that oppressive Christian rulers (back in the days when the church was the state) used to scapegoat Jewish populations for the corruption those rulers presided over. Thinks about it – Jewish populations were present in Europe before Christianity existed. Why should Christians belong and not Jews? Anti-Semite is not just a misnomer, it is meant to mean “you do not belong here,” which, if people fall for it, starts a very specific ball rolling. However, a European invasion of Palestine under a Zionist guise is not much different than the European Christian Crusades of yesteryears. It’s a newfangled way for our newfangled rulers (same as the old boss) to get us to do their dirty work for them. I also hope you don’t mindlessly hate all Americans. As an American I try to stay clearheaded about my total rejection of the Empire’s goals and of the baroque constructs of disinformation created to keep the average citizen complacent by getting them to internalize malicious mythologies. It just means we have to keep our eyes on the ball and not be fooled by the various “shells” such as corporate identities, and state department identities, and media identities that mask the same origins – the same nefarious, shadowed players that play this shell game on us. If only they were as innocuous as the Wizard of Oz. Jerome Corsi states that Homeland Security found direct tampering and manipulation of votes in their investigation. This means a direct manipulation of the Democratic voting. Local people are involved (hint: no Russians). And these manipulations were helping Hillary. There has been much more direct voting manipulations. Redacted tonight has some videos on it. With some humor. Donna Brasil explains how Hillary ran the DNC via money laundering. How The Recount (& Election) Was Rigged By Both Sides! What You Aren’t Being Told About Hacking Voting Machines! Another interesting thing is that DCI / Homenland Security wants to take over all voting. That is “to prevent foreign interference”. Which probably means that any future rigging will be hidden behind a veil of security. Zerohedge: Fancy Frauds, Bogus Bears, & Malware Mimicry – Did CrowdStrike Plant Russian Evidence On DNC “Hacked” Servers? Project veritas has been doing good undercover work. show what is wrong with the media and the system. See also part 2,3 and 4 for more fraud. I could go on but you get the idea. Woolsey: “We do it for reasons of democracy.” No, you do it for reasons of American business interests. And if necessary, they send in the Marines to make the point not so subtlely. Gen. Smedley Butler was charged with undertaking many such mis-adventures in the Philippines, China, in Central America and the Caribbean during the Banana Wars, and France in World War I. He saw it for what it was: as you say, for American business interests. Have you read Butler’s “War is a Racket”? https://youtu.be/c-zEtAuKuUY Russia, its Russia, razzle dazzle them. The depth and breadth of manipulation goes deep. The lie of #RussiaGate not surprisingly provides cover for seemingly endless corruption which includes, in my opinion, the ongoing dirty war of aggression in the sovereign nation of Syria. Former CIA director James Woolsey is on the Strategic Advisory Board for Genie Energy who have scoped out and are doing test drilling for oil in Syria’s Golan Heights which is illegally occupied by Israel. “Israeli Prime Minister Benjamin Netanyahu was one of the first heads of government to go to the United States to meet Donald Trump on February 16, in Trump’s new role as President. After the event major media focused on the themes of Israeli settlements in the West Bank, the Iran nuclear deal or a Palestine two-state solution. “Investment into the energy corporation [Genie Energy] primarily began around the time the Syrian Civil War was beginning to heat up, with equity stakes being purchased. “Genie Energy’s foundation lay in its Strategic Advisory Board (SAB). It includes colorful characters like Richard Cheney, former CIA Director James Woolsey, media mogul Rupert Murdoch & even Lord Jacob Rothschild (Again). “As some will note, James Woolsey (Member: Project For The New American Century) was another one of Genie Energy’s direct connections to Trump, as a senior adviser. There’s also this interesting bit regarding Woolsey, Trump, Turkey, Erdogan and Gulen which relates to the period in 2016, shortly after Woolsey became an advisor to Trump’s election campaign. “Former CIA director James Woolsey pitched a $10 million (7.59 million pounds) contract to two Turkish businessmen to help discredit a controversial U.S.-based cleric while Woolsey was an adviser to Donald Trump’s election campaign, three people familiar with the proposal said. “Just eight days after formally joining Trump’s campaign as an adviser on national security issues, Woolsey met on Sept. 20, 2016 with businessmen Ekim Alptekin and Sezgin Baran Korkmaz over lunch at the Peninsula Hotel in New York, they said. “Woolsey and his wife, Nancye Miller, proposed a lobbying and public relations campaign targeting Fethullah Gulen, a Turkish cleric who lives in Pennsylvania. · James Woolsey, the former CIA director who has been cooperating with the special counsel Robert Mueller, had a “lengthy conversation” with President Donald Trump over dinner last weekend at Trump’s Mar-a-Lago resort. · Woolsey, who served on the board of Michael Flynn’s lobbying firm, Flynn Intel Group, was at a meeting on September 19, 2016, with Flynn and Turkish government ministers in which they discussed removing the controversial Muslim cleric Fethullah Gulen from US soil, Woolsey has said. · Mueller’s team has interviewed Woolsey about that meeting, and Woolsey has been in touch with the FBI since before Mueller began overseeing the bureau’s Russia investigation in May. These are some of his other more recent roles from Wikipedia. Yes, I know, but I find that it’s often a good place to start and have found some valuable nuggets to follow from there at times. “Woolsey is the chairman of the Foundation for Defense of Democracies. He is Chairman of the Advisory Board at the Opportunities Development Group (ODG). ODG did not file a federal tax return in 2006, 2007, 2008, 2009, 2010, 2011 and 2012. He is currently a member of the Washington Institute for Near East Policy (WINEP) Board of Advisors, Advisor of the Institute for the Analysis of Global Security, co-founder of the United States Energy Security Council, Founding Member of the Set America Free Coalition, and a Senior Vice President at Booz Allen Hamilton for Global Strategic Security (since July 15, 2002). “He is a Patron of the Henry Jackson Society, a British think tank. Woolsey has had long-standing contact with Central and Eastern Europe and as a Member of the Board of Advisors of the Global Panel Foundation based in Berlin, Copenhagen, Prague, Sydney, and Toronto. He was formerly chairman of the Freedom House board of trustees. He is a member of the International Advisory Board of NGO Monitor. “Woolsey is a member of the Project for the New American Century (PNAC) and was one of the signatories to the January 26, 1998 letter sent to President Clinton that called for the removal of Saddam Hussein. That same year he served on the Rumsfeld Commission, which investigated the threat of ballistic missiles for the U.S. Congress. “In 2008, Woolsey joined VantagePoint Venture Partners as a venture partner. “John McCain hired Woolsey as an advisor on energy and climate change issues for his 2008 U.S. Presidential election campaign. “In April 2011, Lux Capital announced that Woolsey would become a venture partner in the firm. “In July 2011, Woolsey, in cooperation with Robert McFarlane, co-founded the United States Energy Security Council. Woolsey currently sits on the Board of Advisors for the Fuel Freedom Foundation. “He received an honorary doctorate from the Institute of World Politics in Washington, DC in 2011. “Woolsey was a Board Member and Vice-Chairman of The Jamestown Foundation, and sits on the advisory board for nonprofit America Abroad Media. “He currently serves as Chancellor at The Institute of World Politics and the independent non-executive director of Imperial Pacific. the evils of the Times and Post! and leave them radioactive toast! The purveyors of fake news, the lame-stream media, are obsessed with Russia. Anything and everything Russian is vilified and given the worst possible slant, and this storyline goes on 24/7. So what ever happened to the Las Vegas shooting story? And where is the Sandy Hook elementary school shooting news? And where is the follow-up on the Christmas party shooting in San Berardino, CA and the nightclub shooting in Orlando, FL? And why don’t we hear any more about the shooting attack on a church service in Antioch, TN? We certainly don’t keep hearing about the corrupt Clinton Foundation and its international web of pay-to-play, or the egregious things brought to light from the exposé of Hillary Clinton’s e-mails while she was Secretary of State. Bernie Saunders’ documented betrayal by the Democratic National Committee is never mentioned any more. What happened to the revelations in the John Podesta e-mails? And what happened to the explosive uncovering of elitist paediophilia, child slavery, torture, and ritual sacrifices in aid of peverted sexuality, and blackmail scams? What a world we live in. The truth of things is distorted, at best, and human justice is avoided (just ask Iraqis, Afghans, Libyans, Syrians, Yemenis, and Palestinians). Thanks for this ! a great summary – that needs to be spread. I would welcome an open discussion of election interference- but it never seems to go beyond – the “Russian meddling” meme in the main. Question for you – Are there examples of Robert Mueller III ‘s past public testimony or other statements that might give folks something more to think about than how he is going to ride to rescue by setting up for the impeaching of Trump ? Sometimes you can learn about a topic by listening to how the person presents their argument and how they counter-argue points made against their argument. Here is a case of an MSM Russia Gater, William Arkin of NBC News, arguing in favor of the “Russia/Russians did it” narrative. – His leading argument is an appeal to authority fallacy. He claims “everyone knows” Russia influenced the 2016 election because the intelligence agencies told us so. – There is various vague and unsubstantiated information, claimed as evidence, that when you squint really hard makes a connection when placed together, that points towards Russia having an influence in American politics. If this is the quality of argument and “evidence” that a professional journalist from an established media organization, who has spent a year and a half researching this topic, has to offer, it makes it clear it is hysteria and propaganda.